Within Hollywood’s greatest trilogies, the second film is always the best. So it goes with The Empire Strikes Back and Star Wars, The Two Towers and Lord Of The Rings, and 1981’s The Great Muppet Caper and the first three Muppet movies. With The Empire Strikes Back and The Two Towers, that’s just a symptom of a second act of a story traditionally being more engrossing than its opening passages or its resolution. The Great Muppet Caper succeeds by following a different rule of film sequels: Go bigger. Its predecessor, The Muppet Movie, wowed moviegoers by putting Kermit The Frog on a bike, so The Great Muppet Caper put an entire felt-and-fur ensemble on wheels. As an encore to the feats of contortion that allowed Fozzie Bear to drive a Studebaker in The Muppet Movie, Frank Oz submerged himself for hours in order to give Miss Piggy her Esther Williams moment in The Great Muppet Caper. But it’s not all empty showmanship from Oz, Jim Henson, and company: All the spectacle of the sequel is in service of paying tribute to the magic of the silver screen. After demonstrating that their characters could believably interact with real-life environments, the Muppet crew stayed close to the soundstage for The Great Muppet Caper, losing none of the cinematic pageantry in the process. 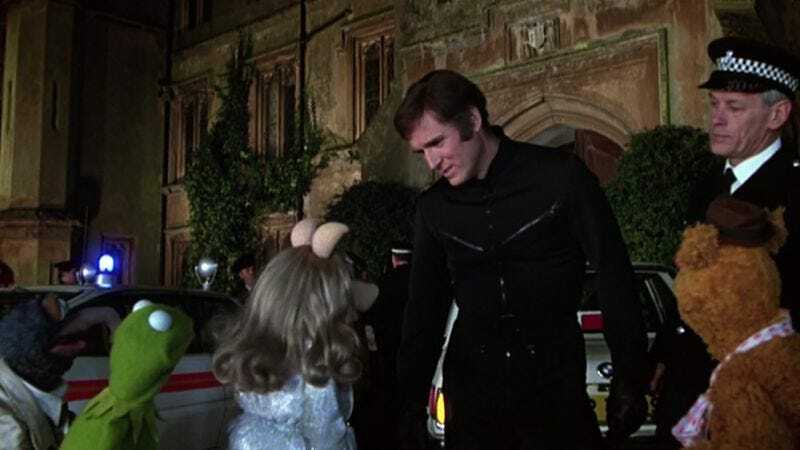 To wit: While the spine of the film is the jewel heists involving human co-stars Charles Grodin and Diana Rigg (and subsequently pinned on Piggy), The Great Muppet Caper is defined by its extravagant set pieces, sequences like a high-flying art-gallery climax, and the all-singing and all-dancing opening number, “Hey A Movie!” It’s a film that positively revels in its big, broad artificiality, deriving tremendous comedic freedom from direct takes to the camera and the running gag that the reporter characters “played” by Kermit and Fozzie are identical twins. (Cue this all-time great throwaway exchange, between Muppet performer Jerry Nelson and his real-life daughter: “Look, Dad: There’s a bear!” “No, Christine, that’s a frog. Bears wear hats.”) Subsequent Muppet films put the characters on Broadway, plopped them into a high-seas adventure, and put them in contact with alien life forms, but none of that matched the natural chaos and hidden warmth of Jim Henson’s imagination quite like The Great Muppet Caper. Not bad for a second try. Availability: The Great Muppet Caper in available on DVD, which can be obtained through Netflix, and to purchase through the major digital services.